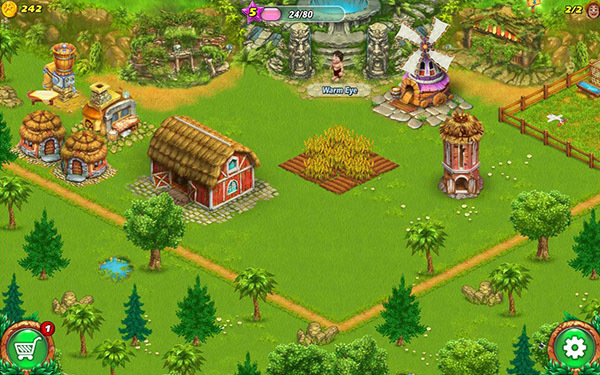 Farm Tribe Dragon Island will whisk you away on the back of a tornado to a new land desperate for your farming expertise. You better plant quickly, the natives of this new land are starving and are relying on you to not only feed them but save them from a dangerous menace. In Farm Tribe Dragon Island, just like Dorothy from the Wizard of Oz, Annie is just minding her own business one day, digging some good dirt, when she stumbles upon a mysterious box that holds a glowing gem. As soon as she opens the box, a tornado comes blasting out of nowhere and scoops her up along with her silo and barn to a strange a wondrous new island. Thankfully, when you arrive you quickly meet another person who’s already been through the same experience, so she’s there to show us the ropes and serves as your tutorial for the game. And it's a good thing, because you're going to need a little help getting around at first. 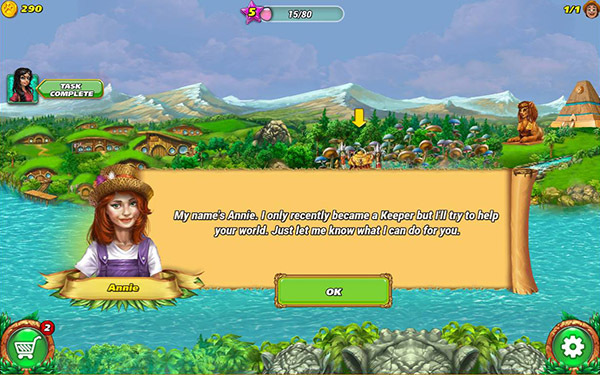 You quickly learn that Annie has been selected as the Keeper of this island, and it’s now her job to farm her heart out in an attempt to feed the island inhabitants and save them from a looming shadow that’s plagued the land. The artwork of Farm Tribe Dragon Island is different as well, kind of that vintage circus clown cartoon feeling, with too shiny faces and exaggerated cheeks and shadows that make the faces look dirty. I know a lot of people like this kind of look, but I'm just not a fan so it turned me off pretty quickly as it gave me the creeps. The artwork of the land and the crops and buildings was much better but nothing really earth shattering or even partiuclarly pretty to look at. Most seemed somewhat dated or even borrowed from another farming game I played five years ago. I'm not going to spend too much time on the music because it was pretty atrocious… it was like the worst possible elevator music you’ve ever had to listen to over and over again as if you were stuck in some endless elevator ride bringing you straight to hell… like terrible vanilla jazz music that needles into your head and now lives there. Do yourself a favor and turn it off and crank your own tunes while you play. The music isn't going to help you play and it's only going to slowly drive you insane. Unless you like elevator music... if so, turn that up. Onto the gameplay of Farm Tribe, which I hate to say, wasn’t terribly intuitive and it was extremely clunky at first. It was like the game was clearly made to play on a phone or tablet with a touch screen and so using the mouse was quite difficult when you had to drag your sickle or basket over the fields to gather eggs. 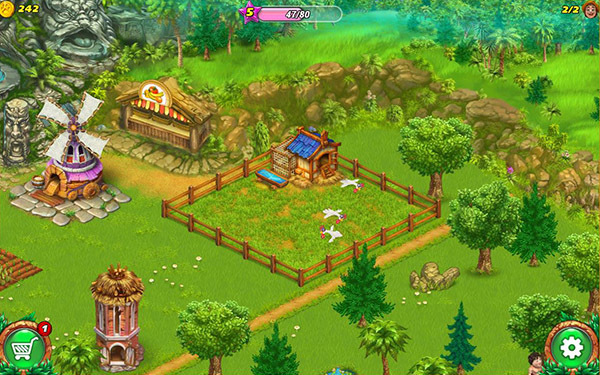 Once I treated it like one of a hundred farming mobile games I’ve played, I caught on… but still wasn’t a fan. The more I played Farm Tribe, the more I caught on to the general jist of playing. You have your tasks that appear on the left hand side of the screen and it usually involves growing some kind of crop or making a food item that they try to tie into a fantastical story about fire seeds and a magical fog. It just doesn't make sense to me. Why am I making this tomato juice? To fight a fog so I can find a seed to maybe make the elder wake up from his stupor? Seems a bit far-fetched to me. 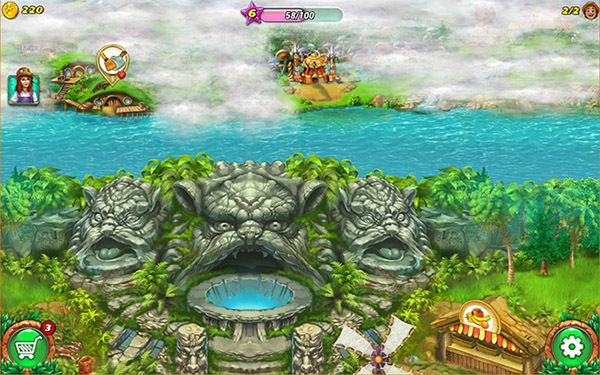 In fact, the more I played, the more I realized this seems like a duplicate of the game Paradise Bay, which is a tablet/mobile game. My mother plays this game constantly and was upset that they've recently announced they will no longer be updating it. So perhaps this new Farm Tribe game can fill the void of Paradise Bay players since it seems very similar in concept and play style. 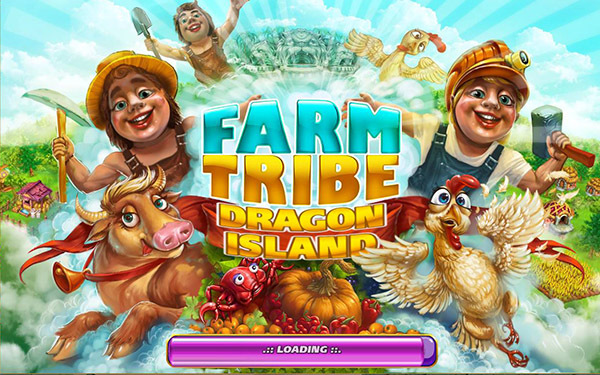 That being said... I’ve played Farm Tribe in the past but Farm Tribe Dragon Island… it just didn’t do it for me. I quickly became bored of it and I didn’t even make it the full 60 minutes in the free trial before I was done with the game and ready to move on with my life. 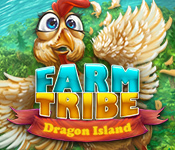 If you want to prove me wrong and give the game a try yourself, you can play Farm Tribe Dragon Island for free for up to 60 minutes by clicking on the download button.